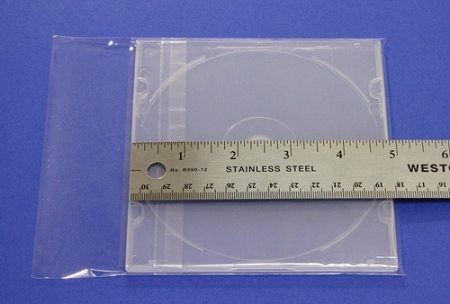 CD Slim Size 5.2mm Jewel Case (short) Shrink Wrap Bags - "Peal & Seal OPP Bags"
CD Jewel Case Peel & Seal OPP Bags with self-seal strip. Bag size is 150mm x 130mm + 26mm flap. No heat gun or special equipment needed. Just slide your thin, slim poly 5.2mm CD Jewel case in, seal with the self-adhesive strip and you're done! The opp plastic bag is crystal clear and lets your case photo or graphic show through. Case is not included, shown for illustration purposes only.